"Plagiarizing content and bait and switch are scummy marketing practices that only a scummy MLM company would tolerate. And Digital Altitude certainly fits the definition of a scummy company. BehindMLM reviewed Digital Altitude in 2016 and concluded it was nothing more than a chain-recruitment driven pyramid scheme. Turns out the FTC agrees, following a complaint filed against Digital Altitude and creator Michael Force last month." 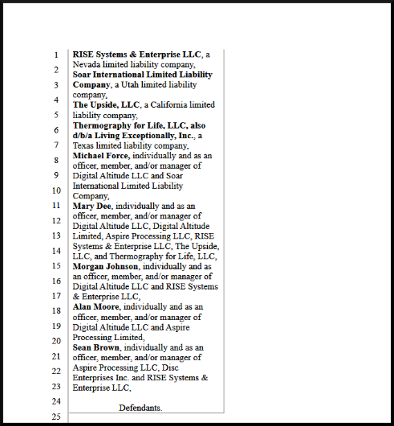 "Following on from a FTC complaint filed under seal against Digital Altitude and Michael Force on January 29th, a requested Temporary Restraining Order was granted on February 1st." Digital Altitude pays consumers only when they recruit new consumers to join the program, in the form of commissions on the new consumers’ membership fees. And, consumers can collect commissions only for sales of membership tiers that they themselves have already purchased." 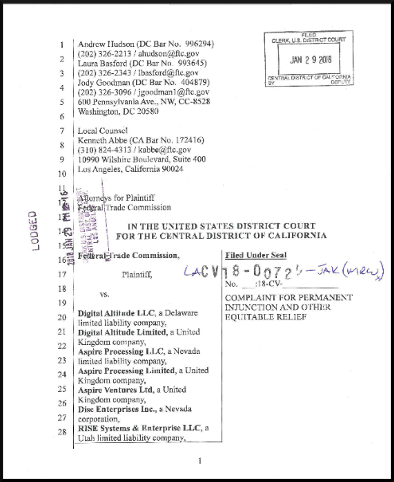 "Following a Temporary Restraining Order granted against Digital Altitude and owner Michael Force on January 29th, a preliminary injunction hearing was scheduled for February 15th. On February 12th the FTC filed a joint Stipulation to a Continuance of the hearing, which was granted the same day. In any event despite Disc Enterprises having not yet been served, the February 14th preliminary injunction hearing has been postponed to March 5th as per a February 12th order." "The FTC’s lawsuit against Digital Altitude continues, with the latest seeing default judgment sought against the company and related entity defendants." "While Digital Altitude has acknowledged it made misrepresentations to the general public, the company and its principals are denying responsibility." "One of the problem MLM scammers have when caught is that outside of the scam they were running, they had no other source of income. In cases where an injunction is pursued and said scammers assets are frozen, that leaves them with limited options for hiring counsel. 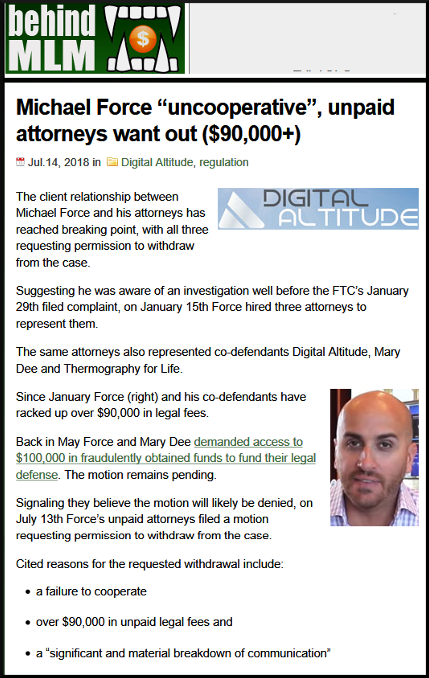 Such is the case with Digital Altitude, Michael Force and Mary Dee, who together are demanding $100,000 to cover legal fees." "Hopes that Digital Altitude may be able to continue its business operations have been dashed, following a declaration by the court-appointed Receiver. has not resumed operations, and has no plans to do so, as he has not determined a feasible means of resuming operations in a lawful and profitable manner. This implies that Digital Altitude not operating as a pyramid scheme is not viable, strengthening the FTC’s case against the company." Receiver: Digital Altitude cannot operate "in a lawful and profitable manner"
It seems Michael Force is intent on playing the ponzi pimps' equivalent of the childrens' game of sticking his fingers in his ears and chanting "I can't hear you, I can't hear you"